As a child, it's believed your parents are invincible. Even though we know we grow up, it's hard to imagine that do too. But the sad reality is the old free get, the older get. In A. Rey Pamatmat's smartly executed House Rules, the heart of family is explored as two sets of siblings, who happened to grow up together, learn that blood is thicker than water as age and illness take a toll on the ones they loved. Through an exploration of culture and generation, House Rules is an ensemble dramatic comedy with an exuberant amount if heart and truth. When Rod and JJ's father falls ill and laid up in a hospital bed, their lives are turned upside down as Dr. Rod is dumped by fellow doc Henry and JJ uproots his rising LA life. Meanwhile sisters Twee and Momo go head to head for attention, affection, and approval by their mother Vera. Through an exploration of generations and culture, House Rules is all fun and games until reality sets in. There’s a universality in Pamatmat’s story. With the exception of Henry, Pamatmat’s characters are Filipino. Through two generational lens’s, Pamatmat explores Filipino tradition and culture allowing for a wonderful narrative. There is an internal conflict for the younger quartet to assimilate yet still honor their heritage. It’s especially seen in the food fight between Twee and Momo. And in the end, Twee and Momo’s spat draws back to family ties. And that’s where the heart of House Rules is. Pamatmat has crafted a beautiful family play. The relationships are genuine. The struggles are true. It’s an honest portrayal of growing up in the adult game of life. Structurally, Pamatmat has crafted a strong narrative for each individual, though Ernie does have a significantly smaller arc. He has taken the time to give each character the respect they deserve. But there is one thing that is striking. Each person seems to have an additional story arc counterpart present. Vera and Ernie are connected. “Bad kids” Twee and JJ end up having one another. Rod has an emotional conflict with Henry. And that leaves Momo without a side companion. Pamatmat suggests some turmoil between Momo and roommate Sheila but without her presence, it’s easily forgotten. Perhaps Sheila existed in another draft and her references are just hold over, but with what is mentioned, some sort of Momo and Sheila arc could be interesting to show the outside stresses Momo must deal with in addition to her family. Though House Rules was an ensemble story, finding the right moment to close the piece seemed a bit hard. Without spoiling anything, Twee and Momo’s personal conflict finds resolution after an event reminds them the importance of family. Pamatmat stylishly harkens back to Twee and her language-learning program that happens to be teaching her family phrases. It’s on the nose but beautiful. You’d think that’s where the black out would come but it ends with Ernie in his hospital bed. Perhaps clarity was not in the production’s favor, based on the script, what was written did not happen. Further more, jumping from the sisters to Ernie seemed illogical. Had we seen Rod and JJ, maybe it would have been satisfying, but alas. Pamatmat crafted a very specific piece of theater. It was exceptionally cinematic in structure. How director Ralph B. Peña overcame the cinematic obstacles was crucial for House Rules success. 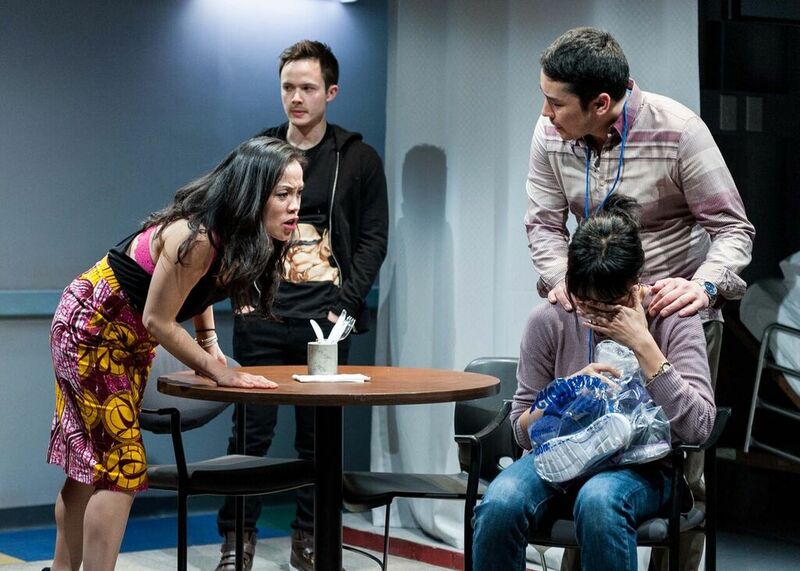 Thankfully Peña did an exceptional job staging the play on Reid Thompson’s sleek design. Thompson truly used HERE to his advantage. It was a fabulous use of space. With so many locations to capture, Thompson married tradition with modern touches strategically placing each local on stage. Perhaps theater magic and Oliver Wason’s exceptional lighting design assisted in the ability to isolate scenes. Sure, you knew everything was visible, but they melted away. The only questionable element of Thompson’s design was the rainbow road tiling on the bottom portion of the deck. While it did create a cool effect with Wason’s tile by tile light up, the colors were jarring and could easily achieved the same success with a neutral pattern. The score that Fabian Obispo used incorporated a pretty lively jazz-infused theme. While it may not have deviated much, but it was present in every transition. It even was used in the end. Shockingly, the mood of the music didn’t match the mood of the moment, causing a jarring feeling. It sadly pulled away from the emotional beat. The company of House Rules was comprised of a pretty stellar ensemble, each bringing a unique flavor. Taking on the grounded siblings, Tiffany Villarin as Momo and James Yaegashi as Rod found strength as the medical kids. On the opposite end of the spectrum were Tina Chillip as Twee and Jeffrey Omura as JJ. Both added a jolt of energy, though Chillip had some moments of sitcom over-acting. As Henry, Conrad Schott was soft, both personality and audibly, and subtle. House Rules is a strong story about family that was smartly executed. The A. Rey Pamatmat and Ma-Yi Theater Company have something special on their hands.